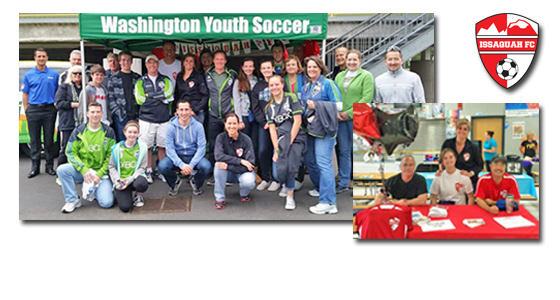 (Jun 16, 2016) The volunteer staff at Issaquah FC is on a mission. Ask any of the parents, coaches and other staff volunteers, and they'll tell you they're involved to put "Players First!" According to the club's interim President Scott Gode, who also serves as President of Eastside Youth Soccer Association, "Not all youth players are looking for the same thing from their soccer experience. They should have a choice, and find the level of competition that best suits their needs in terms of development and commitment level." Gode continues, "Volunteers at the newly formed Issaquah FC are working hard to continue to make sure that all of the league and competitive playing options that have been in place through Washington Youth Soccer are still available to the Issaquah and Sammamish communities." "Growth of the new club has been steady," reports Kelly Galloway, the club's Registrar, "especially since players and families are starting to realize that without the newly formed club, they lose access to key leagues in which they've thrived until now." These include EYSA leagues for U8-U12 recreational players, Washington Youth Soccer District 2 for U13-U18 recreational players, and the North Puget Sound League (NPSL) for U10-U18 Select teams. Through its close partnership and affiliation with EYSA, Issaquah FC also offers access to Premier, the highest level of youth soccer, through EYSA-member club, Eastside FC. Issaquah FC's early success is directly attributable to its dedicated volunteers and their mission, including the help of an impressive volunteer Steering Committee from across all walks of life. "It really is amazing what we've been able to accomplish in such a short time," says Gode. "The volunteers made it all possible, everything from getting the word out, to building a website, organizing successful tryouts, getting players registered, getting fields allocated, and laying the groundwork for sound club stewardship." Registration is currently open for Recreational players through June 29, 2015, and the club is still forming teams at most ages. Mod teams (so-called because they play modified recreational small-sided games) from U8 to U11, will play in the EYSA leagues, competing against teams from Bellevue, Lake Hills, Mercer Island and Newport, while older U13-U18 players will compete in Washington Youth Soccer District 2, serving the greater eastside communities of Seattle. Practices begin in August, and league play begins after Labor Day. Registration is also open for the club's U6-U7 Micro program, designed to fit the needs of its youngest players. Players receive a full uniform kit and ball with registration. Competition for the Micro program is intra-club. Games take place on Saturdays, and players take to the pitch after Labor Day. By putting youth players first, and not losing focus to costly adult leagues, Issaquah FC is able to keep costs lower. Leadership by community volunteers also helps, and opens the door for more kids to be able to enjoy the world's beautiful game. And, that's exactly what the whole of Issaquah FC has in mind. Click here to learn more about Issaquah FC.